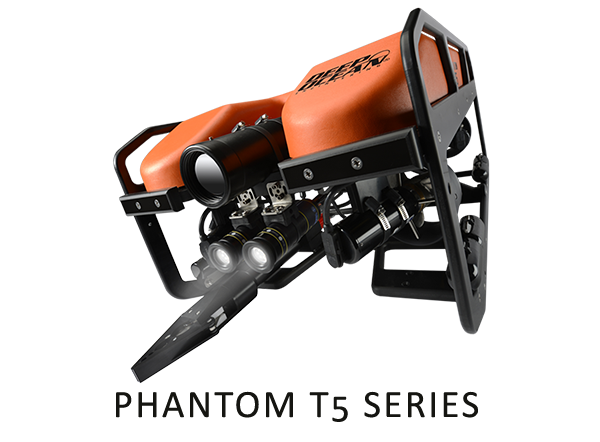 The Phantom® T5 is a rapid deployment high-performance ROV system that provides more power and versatility compared to other vehicles in its class. Its polypropylene chassis is resilient, non-corroding, and maintenance free. The design of its four vectored horizontal and one vertical Tecnadyne® thrusters provides significant control and propulsion in current, with abundant propulsive force to maneuver aggressively in all directions. The Phantom® T5 is a rapid deployment high performance ROV system that provides more power and versatility compared to other vehicles in its class. Its polypropylene chassis is resilient, non-corroding, and maintenance free.